Emma Barnett is an award-winning journalist and broadcaster. 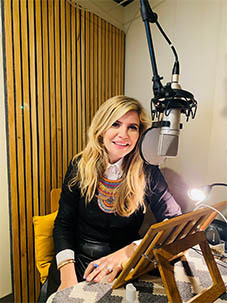 She is the host of the BBC 5Live morning programme, 5Live Daily with Emma Barnett, which goes out Monday to Thursday 10am-1pm. The Wednesday edition is a politics special, coming live from Westminster. ‘Westminster Wednesdays’ sees Emma interview the great and good of politics - demanding answers to her listeners’ most pressing questions about life in Brexit Britain. Her interviews in the summer of 2017 with the Prime Minister and Jeremy Corbyn made front page news. On Thursdays Emma’s 5Live prime time programme takes live radio to places it wouldn’t normally go and uncovers news stories that surprise and inform her audience. She also creates a space where high profile guests and listeners alike can have conversations on air they would normally hold in private. Emma’s show also shares breaking news in a unique fashion, allowing her listeners to shape the day’s agenda. On BBC 5Live she also presented The Hit List, a fast-paced innovative Sunday evening show which counts down the nation’s top 40 news stories, based on their digital reading habits. It has been praised for reflecting the “real people’s news agenda”. Emma regularly presents BBC Radio 4’s Woman’s Hour – a lifelong dream realised and is the youngest presenter in the programme’s history to do so. As part of her ongoing work for the show, she chairs the Woman’s Hour Power List – rewarding the UK’s top women every year for their achievements and records in-depth features. A stand-out project was her retracing of Sylvia Pankhurst’s footsteps for a special Woman’s Hour series covering the lives of working women in today’s Britain. She was previously the Sunday drive-time host on LBC, where she cut her radio teeth. Emma is a columnist for The Sunday Times. Every week, in her aptly named column, Tough Love, she doles out ruthlessly honest advice to Sunday Times Magazine readers, who come to her with their deepest problems – from difficult children to even worse partners. Television-wise, Emma has co-hosted The Pledge, a straight-talking weekly debate programme on Sky News. She is currently the co-host of Sunday Morning Live on BBC1. Previously Emma spent seven years at The Daily Telegraph – where she was the Women’s Editor and a top columnist. During her time at the paper, she created, launched and edited Telegraph Wonder Women – the “go-to site for young women in Britain” according to the British Press Awards. Covering news, politics, work, society, religion and relationships, Emma came up with the idea after feeling exasperated with the way ‘women’s issues’ were being covered by the mainstream media. Prior to becoming The Telegraph’s Women’s Editor, she was the newspaper’s Digital Media Editor, breaking news about the fast-moving world of technology and media, interviewing Silicon Valley’s biggest hitters and penning a business column. She was named Digital Journalist of the Year twice by the Association of Online Publishers and the Online Media Awards. Emma is thrilled to have had the opportunity to deliver a TEDx talk, prompting her to explore an issue close to her heart: female ambition. In her thought-provoking talk ‘The Secrets That Snails Can Teach Women About Success’, she explains how women are just as ambitious as men – but regularly end up “losing custody of their ambition, often without even realising it”. She is a regular documentary maker for Radio 4 and the BBC World Service. Recent docs include: America’s Fan Club – a behind-the-scenes look at the Daughters of the American Revolution – one of the largest women-only groups in the world – who congregate once a year in ballgowns and white gloves in Washington. Emma has also investigated the rise of mindfulness; the march of military women to the front line; and in a highly personal piece – her hypocritical views of female rabbis. She also enjoys chairing live events – hosting big ticket events such as ‘Telegraph Question Time’ at The Hay Festival; panels at the Southbank Centre’s Women of the World festival and evenings for the prestigious 30 Club. Emma regularly hosts evenings with top celebrities for the children’s rights charity Plan UK. Emma is a proud long-time volunteer for Smartworks, a charity that helps disadvantaged women get back into the workplace through dressing and preparing them for job interviews. She also loves travelling, eating and cooking (but mainly eating) with her husband. Emma is currently learning how to draw and paint (badly)….